The debut feature from Stephen Brown, The Sea (2013) is a compassionate rendering of John Banville’s Man Booker Prize-winning novel. 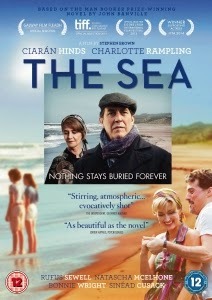 After losing his wife Anna (Sinéad Cusack) to cancer, Max Morden (Ciarán Hinds) returns to the Irish seaside town where he spent summers as a child. He stays at a boarding house owned by Miss Vavasour (Charlotte Rampling) and shares mealtimes with permanent resident Colonel Blunden (Karl Johnson). He’s utterly overwhelmed by grief and shows no signs of healing. “Fleeing one sadness by revisiting the scene of an old one doesn’t work,” he tells his landlady. Max is an art historian and is supposed to be writing about French artist Pierre Bonnard. Instead, Max drinks heavily, gets thrown out of bars, baits Blunden and walks at night along the beach while all the time reliving his last few months with Anna. Through flashbacks we learn of the childhood friendship he had with the Grace family. Led by their raffish and flamboyant father, Carlo (Rufus Sewell), they were everything his plain, hard-working family was not. The Graces rent an expense holiday home, while Max’s family live in a two room ‘chalet’ with no proper toilet facilities. Max is bowled over by the Grace’s exuberance, their familial feuds and boisterous charm. He is proud to be taken into Carlo’s confidence, is secretly in love with Connie (Natascha McElhone), while shyly courting their daughter Chloe (Missy Keating). He’s also insistently curious about their young minder Rose (Bonnie Wright). Banville’s screen adaptation perfectly distils the essence of his novel’s main themes. It is no mean feat to capture the interior musings of one man on celluloid. The Sea is as much about the nature of memory as it is about loss and Brown has produced a quietly affecting film that is not afraid of using silence to great effect. In Banville’s script, often what is left unsaid is as important as what is spoken. Brown is well served by a stellar cast – Hinds delivers a terrific performance as a man who falls apart and gradually puts himself together again. John Conroy’s superb cinematography, set against the dark roiling sea is also particularly memorable. The scenes from Max’s childhood are shot through with a sun imbued glow whereas the present is muted reflecting Max’s perspective – he seeks solace in the past when faced with an uncertain future. The Sea is a poignant meditation on love, grief and loss, a slow burning drama and a fine debut.